One of the reasons Dave and I really loved the name Suzianne Newman was that the URL was available. 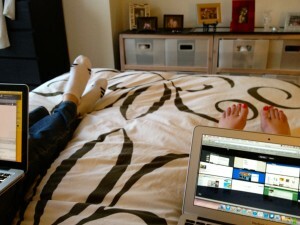 Sitting in bed, setting up this blog in late February, 2012. (Note my swollen feet and amazingly pedicured toes). Suzianne is our first and only child. She was born on March 5, 2012, one week before her due date, in Washington, D.C.
My pregnancy, labor and delivery were nearly perfect. My postpartum experience was less so. When we started this blog, we thought a few close friends might read it. Within a few weeks, journaling my story became therapeutic for me. I blogged every day for three months. Soon, a whole lot of other people–including old friends, family and complete strangers–started reading it. Nowadays, we live and work in the craft beer capital of the World, San Diego, California, with our tea cup poodle, Georgia Lee. We appreciate every one of you, and find it humbling that so many of you chose to spend so much time here, and share this site with the women in your lives. If you need to reach me directly, feel free to email me at Margie (at) FlackRabbit (dot) com. In the meantime, surf on through, and leave a comment or two!